What a great concept to put drops in the toilet before actually going. And this helps prevent the smell of oder. I like this stuff it is great to use before my husband goes ha ha. With one bottle you get over 400 uses. You can carry this in your purse or your pocket. So all you do is place the drops in the toilet. This come in a variety of scents that I'm sure anyone will find one they like. I received the packets that are just as good but only good for one use. Q: What is Just a Drop? 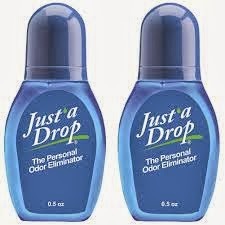 A: Just a Drop is the first personal toilet bowl odor neutralizer that works to eliminate 98% of bathroom odors directly at the source. Q: How does Just a Drop work? A: Simply put one drop in the toilet before you go to the bathroom. Just a Drop creates a seal directly on the waters surface, blocking odors from escaping, until they are flushed away, while leaving behind a, fresh scent. Q: Where can I get Just a Drop? Can I buy it in stores? A: Just a Drop is not yet available at retailers in the US. You can purchase it by clicking here. You may also place an order by phone using a major credit card at (888) 887-3468. Our representatives are available to take your call Monday through Friday, 9:00am-5:00pm EST. Just a Drop comes with a 100% Money Back Guarantee, so if the product doesn’t work for you for any reason, simply send it back for a full refund. Q: Is it safe for my toilet? A: Yes, Just a Drop is environmentally friendly, biodegradable and safe for all toilets and septic systems. A: A bottle of Just a Drop has enough liquid to last for 400 uses. Single use packs are equivalent to one drop each. Q: What is it made of? Is it harmful? A: Just a Drop is composed of a natural eucalyptus extract and mild fragrance oil. The solution is non-abrasive and environmentally safe. Q: I have a medical condition. Will Just a Drop work for me? A: Orders typically take 7-10 business days to arrive. Rush delivery is optional and takes 2-3 business days. A: Yes. It is completely safe to use your credit card. Justadrop.net uses Yahoo! Shopping, one of the most secure online shopping services on the net. Yahoo! Shopping makes credit card purchases simple and safe with one SSL-secure password.